Contents of box, velcro on flash head not included. Sony HVL-F42AM Discontinued in 2011. 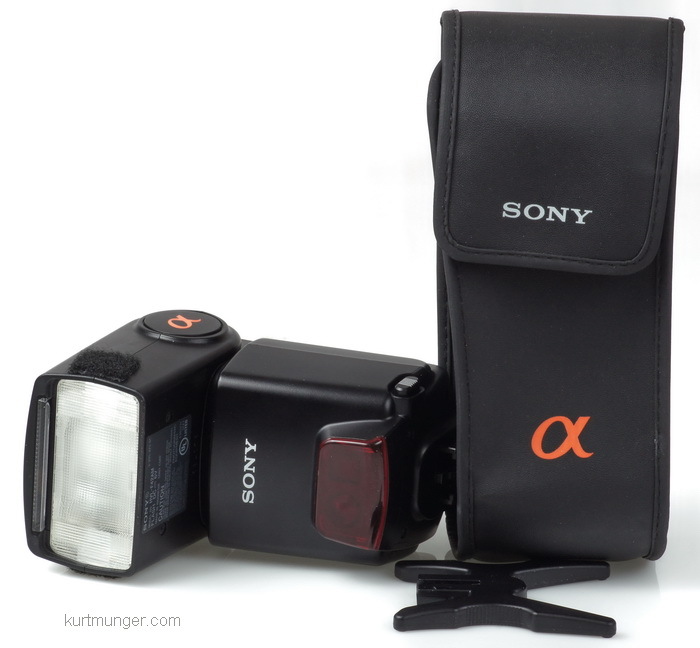 Sony ESupport for HVL-F42AM Go here and click on the 'manuals, specs and warranty' tab. Flash, stand, vinyl pouch and instructions. 42 (138') ISO 100, @105mm zoom position, and 35 (112') at 50mm zoom. Maximum output seems similar to other models with same rating. No LCD, but has panel with illuminated settings. 2" x 1.2" (53mm x 30mm). Has battery indicator, zoom length with wide panel down indicator, power levels, HSS, wireless channels, and auto levels. On-off slider, test/charge button, select buttons for mode, HSS, level and zoom. About 3 sec at 1/1. Half-power (1/2) recharge is almost instantaneous for a couple of pops, then it slows down. Yes, 30sec, 3min, 30min and none. Wireless flash mode power save can be set to 60min or none. Six full levels only; Auto, 1/1, 1/2, 1/4, 1/8, 1/16, and 1/32. Built-in, pulls out and down, covers 16mm, (11mm APS-C) and shows on display when attached (Wide). 45°, 60°, 75°, and 90°. Left, 30°, 45°, 60°, 75°, 90°, - right, 30°, 45°, 60°, 75°, 90°, 120°, 150°, 180°. Auto, wide (16mm), 24mm, 28mm, 35mm, 50mm, 70mm, 105mm. Internal, and fully automatic in auto mode. Yes, the flash knows what focal length the lens is at, either full frame or APS-C format. Five settings may be changed. Wireless CH1/CH2. Time to power save-30sec, 3min, 30min, none. Time to power save when using wireless flash; 60min/none. 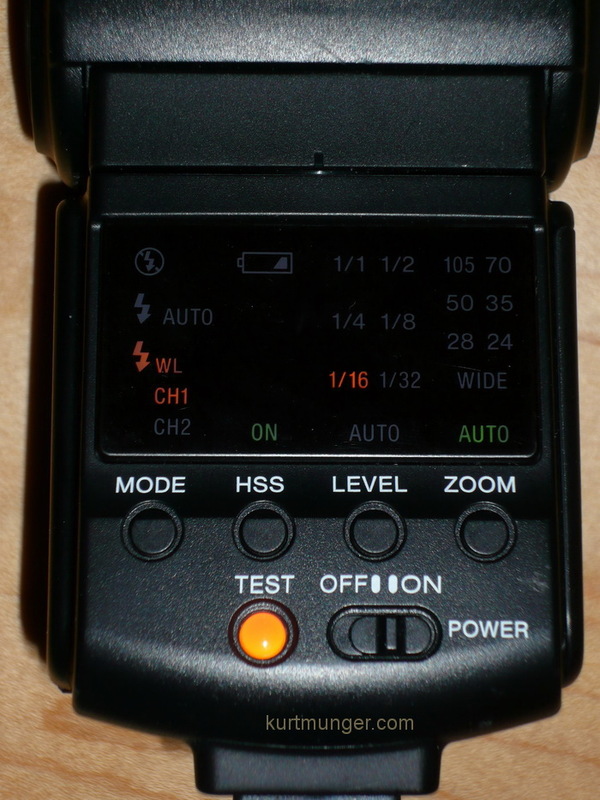 Recording modes in which manual flash may be set. Brightness setting of the display, bright/dark. 3.0"W x 6.4H x 2.4D 76mm x 162mm x 62mm Maximum length 6.4" (162mm) including shoe mount. Length and depth measured with flash flat. 11.8oz (335g) without batteries, 15.5oz (439g) with batteries. Will work with Radiopoppers™ triggers with Sony cable adapter or other connection, but needs to be mounted on camera first, with both (camera and flash) turned off, then both turned on, then flash is taken off camera and attached to receiver. If power save turns power off, you must do this again. Advice; turn off power save when using radio flash triggers. Flash will fire even if it isn't charged sufficiently, so check the charge indicator before shooting, otherwise you may wind up with the wrong exposure. It does this so you won't miss a shot waiting for the flash to fully charge. Can be custom set for full manual use in all recording modes, even "auto." Flash is automatically turned off when camera power is turned off, then back on if flash is still switched on. everything, it's easy to use, and great for beginners. Highly recommended, but not available new. Replaced with HVL-F43AM in early 2011.